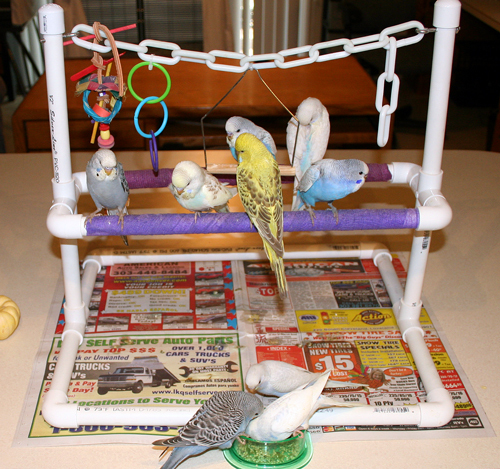 This is a “budgie baby page” — we put one of these together for each round of budgie parakeet chicks so our adopters can ooh and aah over all the cuteness while they wait to bring their feathered friend(s) home. The babies on this page have already been reserved. 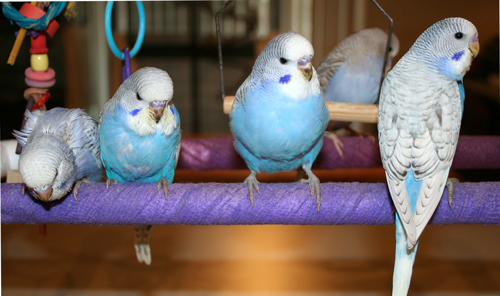 If you’d like to be added to our waiting list for a chick of your own, please read about our specialized breeding program for details! 12/26/11: NEW PHOTOS ADDED! SCROLL DOWN to view them! 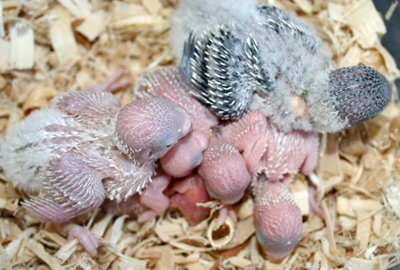 And bookmark this page to check back for progress updates and new photos as the chicks grow! 1/7/12 UPDATE: All available babies have moved on to their new homes. I love updates and pictures so send ’em my way, please! Summary: 4 pairs were placed together in mid-September. Their 21 chicks will be weaned and ready for new homes in early/mid December 2011. 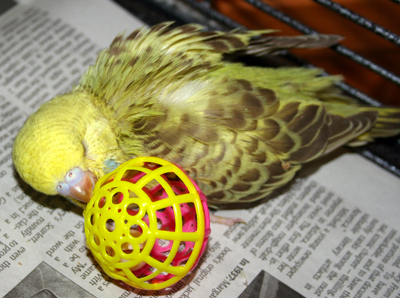 If you need a cage, food or bird supplies, please click on our bird supply page to see what we offer our adopters. 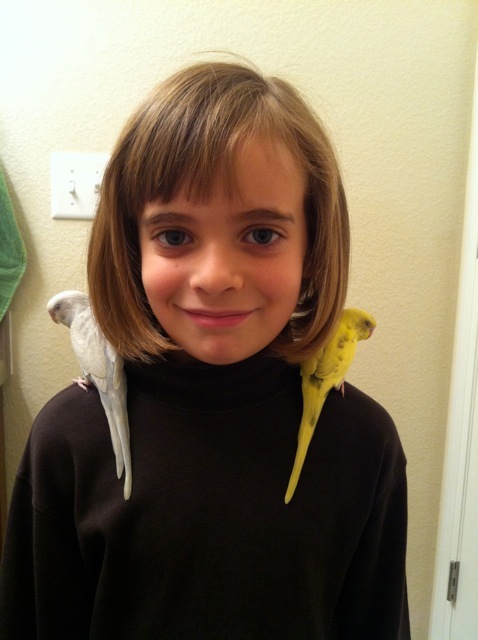 12/3/11: “Ahoy” and “Marina” at home with their new owner! 12/4/11: “Admiral” and his new owner! 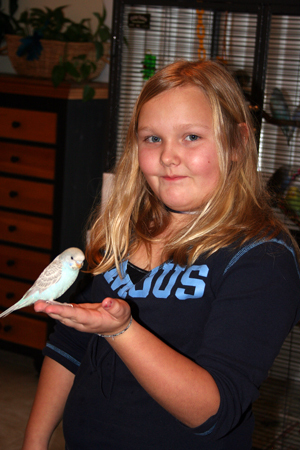 12/4/11: “Ketch” and her new owner! “Skipper” and her new owner! And no, not all the babies went home with young ladies… it’s just that the adults are often too bashful for photos I suppose! 11/30/11: The play gyms and baby flight enclosures are located in our busy home office/homeschooling room. Exposing very young animals to novel, positive experiences helps them learn how to handle stress better and grow to become more confident as adults. And the more time they spend in the company of humans, the more likely they are to include YOU as one of their flock! 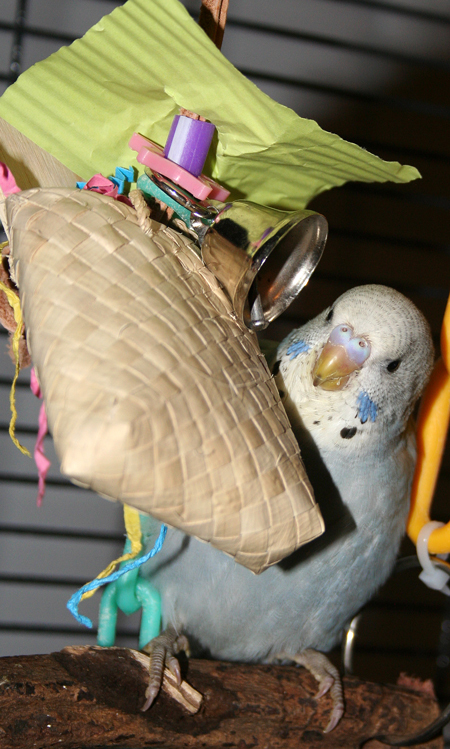 We take our job seriously, spending 6-10 hours per day caring for and socializing with our feathered charges. 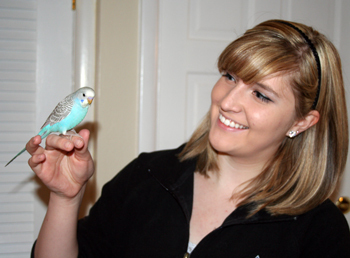 11/30/11: A small bird with BIG eyes, “Skipper” loves to snuggle up in my hair while riding on my shoulder. 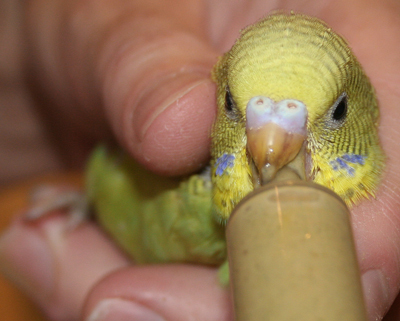 Female green greywing American parakeet from AquaMan x Dijon. 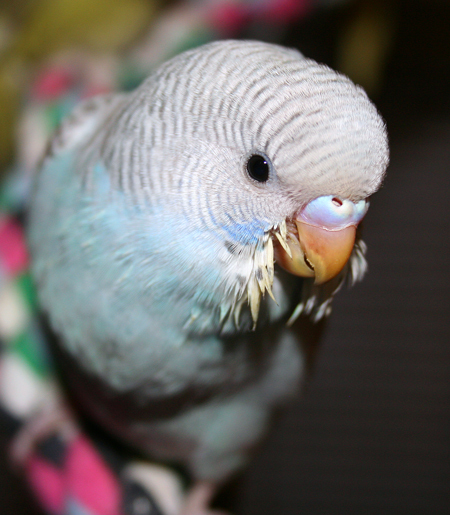 “Hey, ma, you lookin’ for me?” 11/27/11: “Ketch”, skyblue greywing American parakeet female (AquaMan x Dijon). 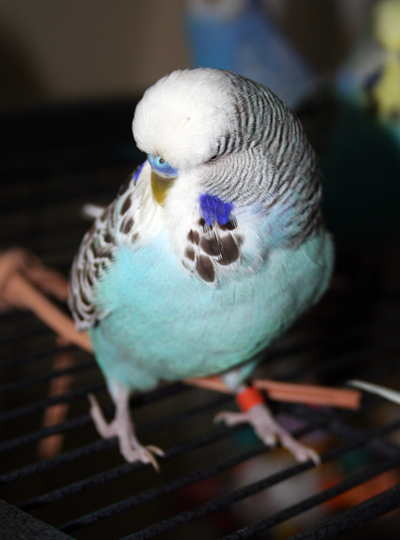 11/27/11: “Scooby Doo”: Yellowface skyblue dominant pied cinnamon-wing female American x English budgie cross at 1 month of age. (Ontario x Marley) Note: my flash overpowered her colors — I’ll take another picture soon. She reminds me of a luscious creamy taffy with all the flavors swirled together. Yummy. 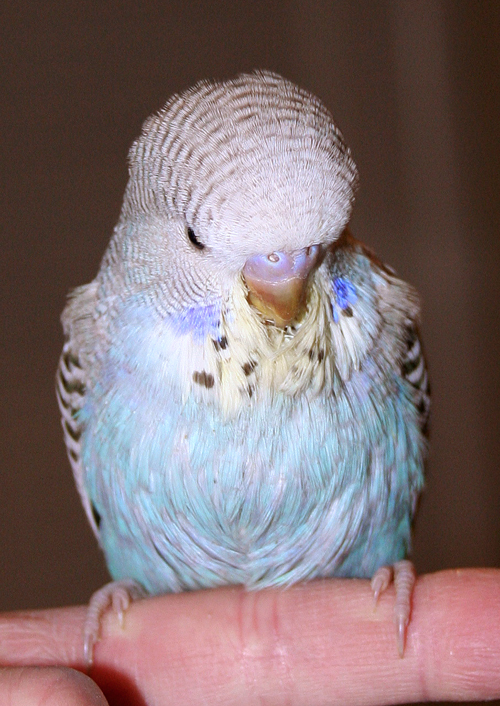 11/27/11: “Basil”: Skyblue cinnamon-wing English budgie at 1 month of age. 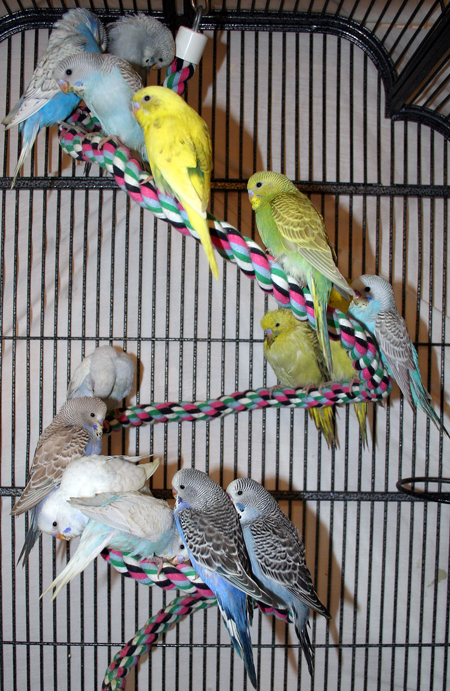 11/25/11: The rope spiral twister, one of the babies favorite hang outs! Top to bottom: Meredith Grey, George O’Malley, Ketch, Ahoy, Furl, Admiral, Paprika, Nutmeg, Marina, Benji, Barkley, Lassie, RinTinTin, McDreamy. 11/25/11: “Miranda Bailey”: she’s the youngest baby of this round. 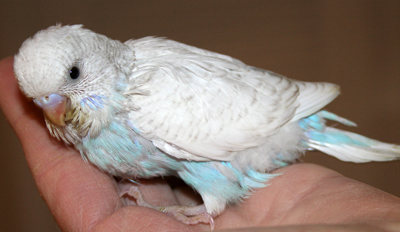 Opaline violet (sf) spangle. (Mars x Erie). 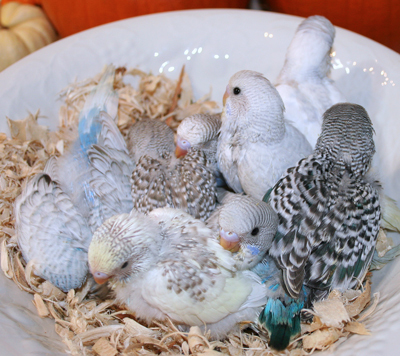 11/23/11: A ball of fluffiness… “Paprika”: Opaline light grey-green cinnamon wing female English budgie (Patootie x Huron). 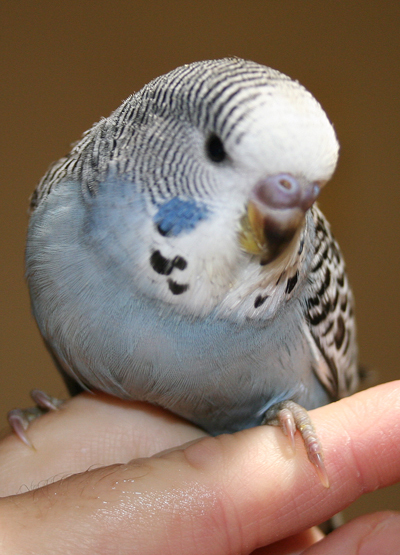 11/23/11: “McDreamy”: Dark gray normal male English x American cross budgie (Mars x Erie). 11/22/11: Play hard, sleep hard. While in a spacious cage, the babies prefer sleeping as closely as possible. Too cute! Left to right: Benji, Nutmeg, Meridith Grey, Furl, Lassie, McDreamy, Ketch, Barkley, Alex Karev, Paprika. 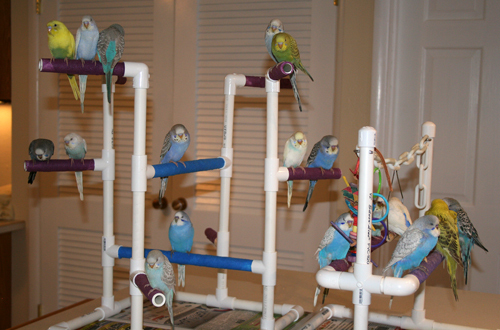 11/22/11: Some of the youngest of our growing flock waiting for breakfast. Front left to right then back: Miranda Bailey, Skipper, Alex Karev, Scooby Doo, Benji, Vanilla Bean. 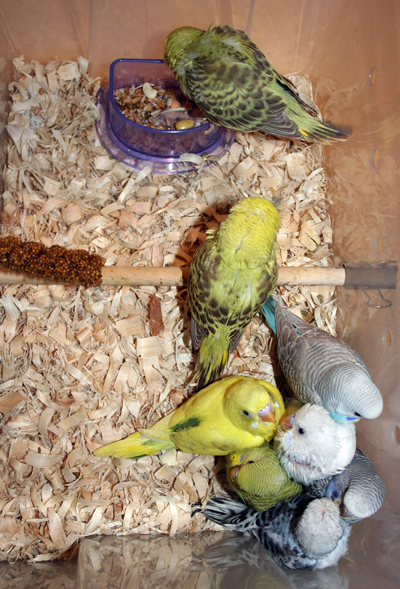 11/19/11: The older babies graduated to the nursery cage today! No one is flying yet, but they will be soon! 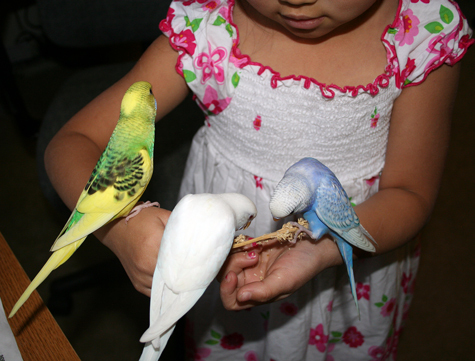 They are learning to perch, play, and nibble on solid foods. 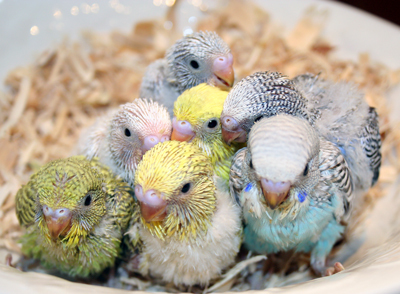 11/17/11: How do you get a bunch of baby budgies to stay still for a photo? Well, you don’t. You put them in a bowl and keep on clickin’. This is the younger to middle aged group currently being handfed. They look like a bowlful of jellybeans! 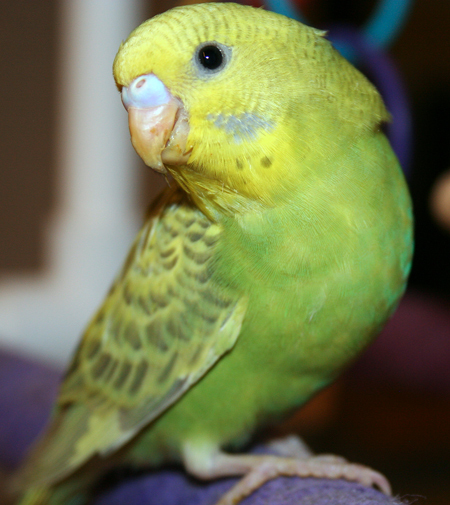 11/17/11: (“Skipper” #62 AquaMan x Dijon) Light green greywing American parakeet. She will start hand-feeding tomorrow. 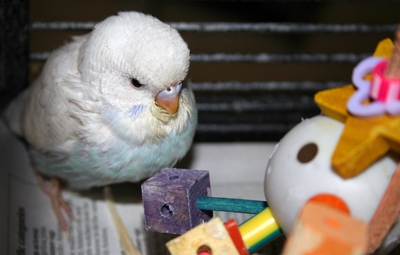 11/16/11: (“Scooby Doo” #71 Ontario x Marley): Yellowface type 2 blue cinnamon pied female English budgie x American parakeet cross at almost 3 weeks of age. You can just start to see the blue feathers showing on her rump. The soft yellow with cinnamon brown is such a pleasing combination! 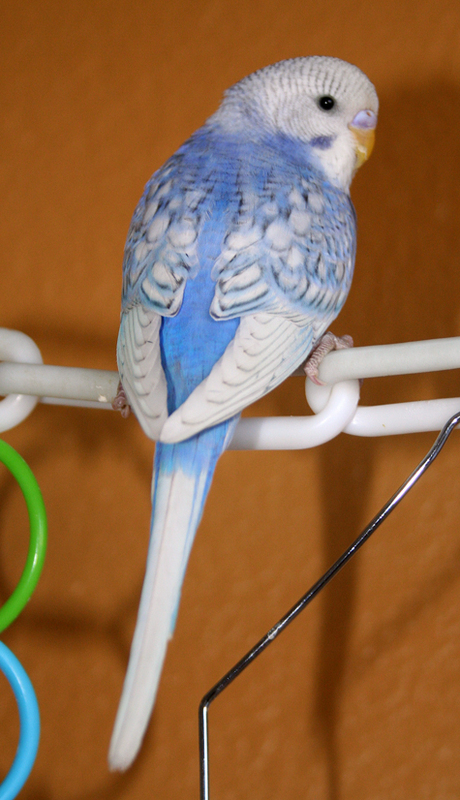 11/16/11: (“Lassie” #68 Ontario x Marley): Skyblue cinnamon-wing spangle female English budgie x American parakeet cross. 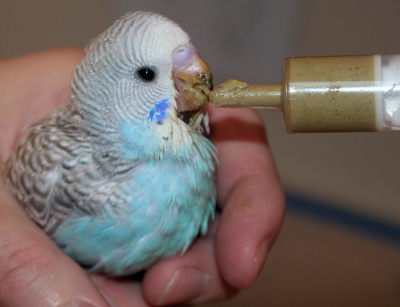 11/16/11: (“Marina” #60 AquaMan x Dijon): Dilute whitewing blue American parakeet at 3.5 weeks of age. 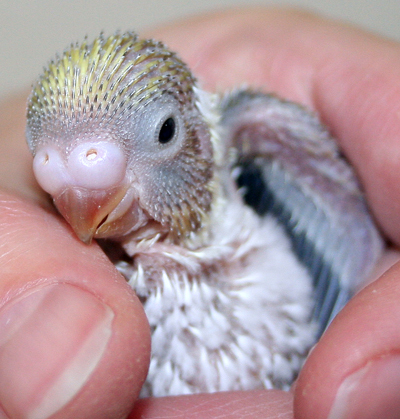 11/15/11: (“Ahoy” #57 AquaMan x Dijon): Recessive pied dark green greywing American parakeet at 4 weeks of age. Very attentive, sweet little thing! She’s always watching me. 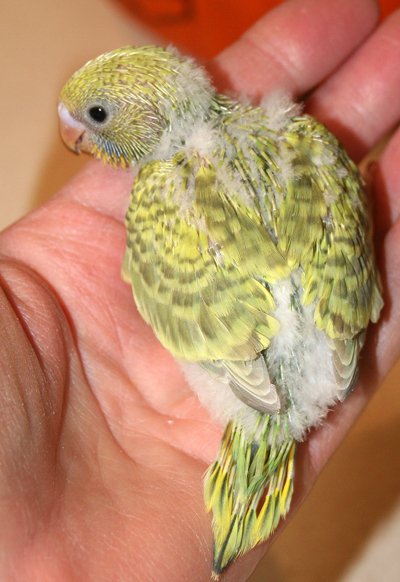 “Ahoy” is as bright yellow as a canary, but with a gorgeous shade of green on the lower belly and rump — see the photo below to see the green. 11/15/11: Here are the oldest chicks of this round (3.5 to 4 weeks of age). They’ve graduated to a larger brooder with a low perch, a spray of soaked millet and a smorgasbord of my germinated organic food mix to explore. They are still being hand-fed 4x a day with formula. Their brooder is portable and is placed wherever our family is so they can get accustomed to normal household activities. 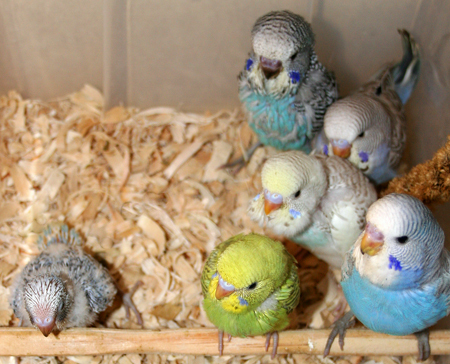 11/13/11: It’s so fun when the babies’ colors reveal themselves! 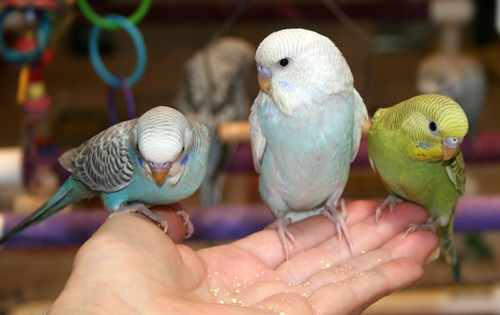 Here we see a blue spangle (left, “Alex Karev”) and a violet cinnamon-wing (right, “Benji”). They will be lovely when they finish feathering out. There are a total of 4 blue/violet spangles in the nest box. 11/13/11: ( “RinTinTin” #67 Ontario x Marley) I’m hand-feeding the babies every 4 hours now. RinTinTin is a handsome English x American cross boy. In person, he’s looking violet (camera isn’t picking it up well). 11/13/11: (“Admiral” #58 AquaMan x Dijon) “Admiral” looks just like his poppa and feels as soft as cotton. 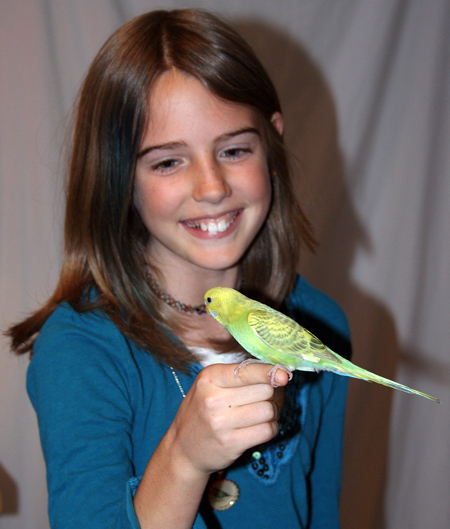 He’s a skyblue greywing American parakeet. We hand-feed our babies with Harrison’s Organic Juvenile Formula (expensive but worth it) and add a pinch of cinnamon, cayenne, garlic and other spices (great antioxidants), plus a squirt of organic pureed vegetables to the mix. Yum, yum! 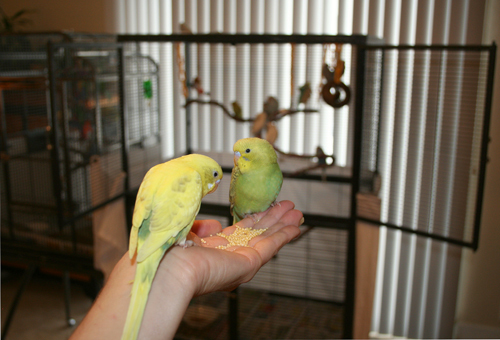 11/13/11: (“Furl” #59 AquaMan x Dijon) Hand-feeding a darling little green greywing female American parakeet. She looks a lot like her mom, Dijon. 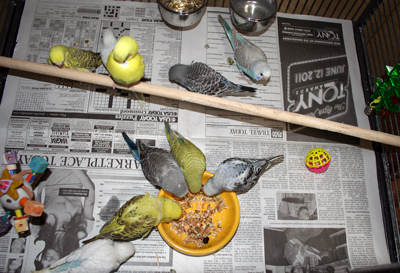 11/9/11: We are now hand-feeding 7 of the oldest chicks! 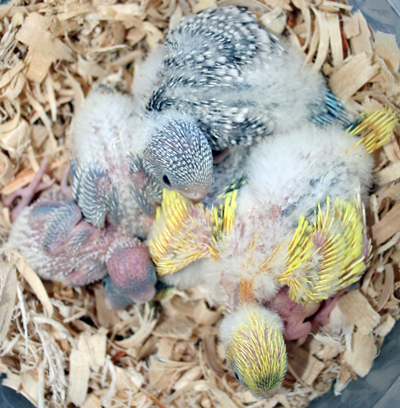 (The remaining 14 younger chicks are still with their bird parents as we handle them daily while they grow. As each chick reaches 3 weeks of age, they will join the hand-fed bunch.) We have a wide variety of colors and mutations represented here. It’s so exciting to see their pin feathers open up, revealing their colors! 10/17/11: We have 30 eggs that are beginning to hatch! The hen feeds her newborn chicks “crop milk” — this is important in establishing good health and immunities. The tiny eggs and newborn pinkies are no larger than a thumbnail. 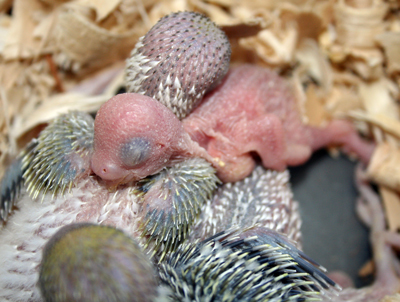 They grow quickly, though: Until the 8th day, budgie chicks are naked and blind. 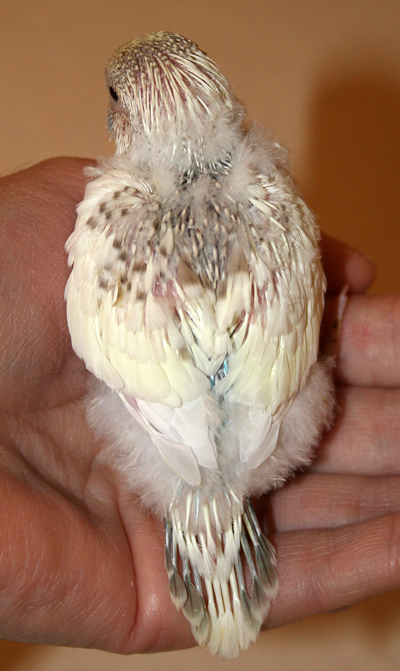 Then down feathers appear (a normal marked chick’s down is grey; an opaline’s down is white). Next the wing feathers and then the tail feathers grow. About the 14th day, the colorful body feathers will appear. This is when we are busy figuring out the colors of our chicks! At 14 days of age, we start handling the chicks daily so they get used to human touch. 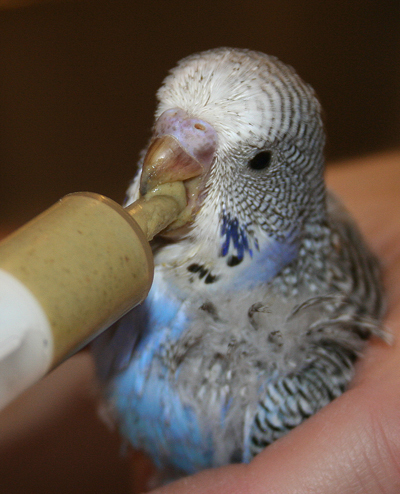 At 21 days, we remove the chicks from the nest box permanently so we can hand-feed and socialize them around the clock. First picks for Jen, the breeder, as indicated below. 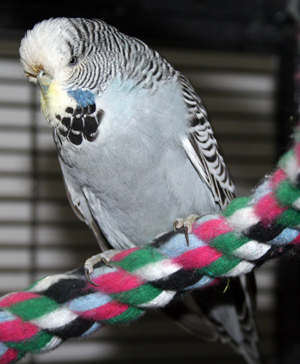 MOM is”Dijon”: SF clearwing dark/gray green female American parakeet. 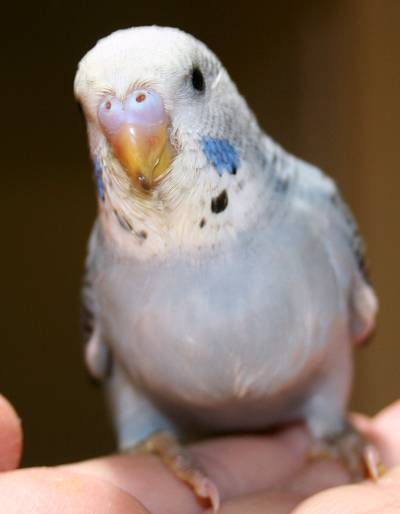 Split blue and recessive pied, possibly dilute. DOB ~2010. 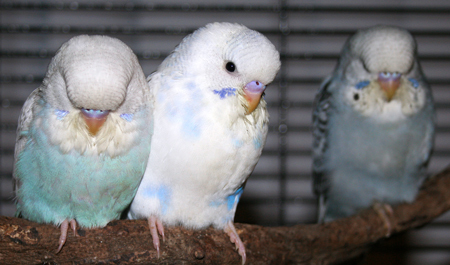 Splits: 100% of the greens split for blue; 50% of chicks split for recessive pied. Outcome: 7 eggs; 7 fertile; 6 chicks (1 DIS w/ egg hole). First egg laid 9/28/11; last egg on 10/10/11. First chick hatched 10/17/11; last hatched 10/28/11. 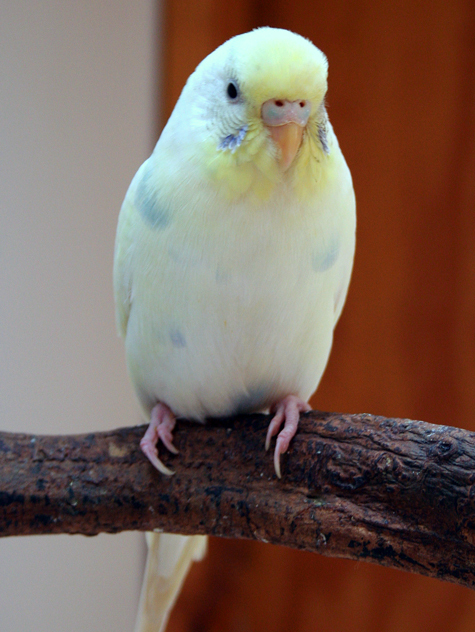 DAD is “Patootie”, an opaline grey-green. MOM is “Huron”, a skyblue cinnamon-wing. 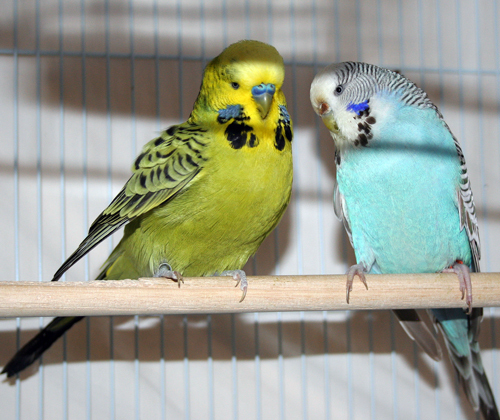 Both are English Budgies. 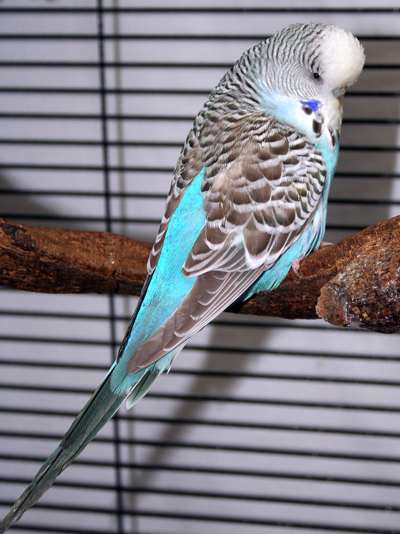 “Patootie”: Grey-green opaline male English budgie. Split: Texas Clearbody, cinnamon-wing, blue. 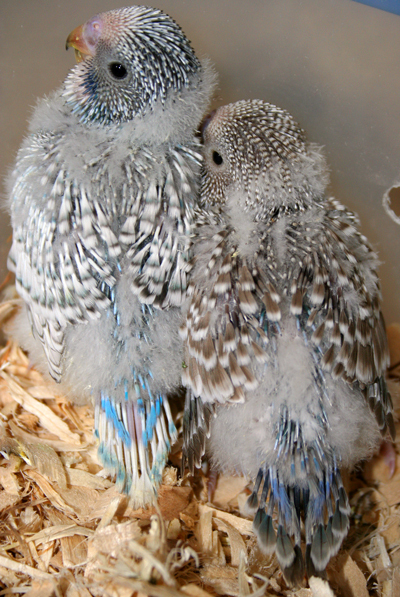 “Huron”: Sky blue cinnamon-wing female English budgie. Colors: 50% blue, 50% green, 50% with grey factor. Outcome: 7 eggs; 7 fertile; 4 chicks (3 DIS). First egg laid 9/25/11; last egg on 10/8/11. First chick hatched 10/20; last hatched 10/27/11. Note: I will be keeping all Texas Clearbody females, plus likely all males from this clutch. Therefore, only non-TCB females will be available. 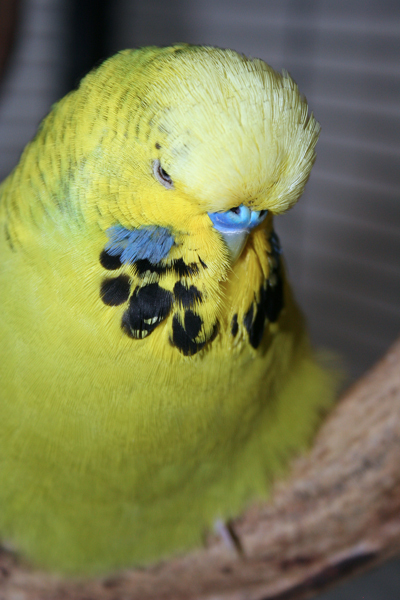 DAD is “Ontario”, a Skyblue Cinnamon-Wing English Budgie. DOB 2010. 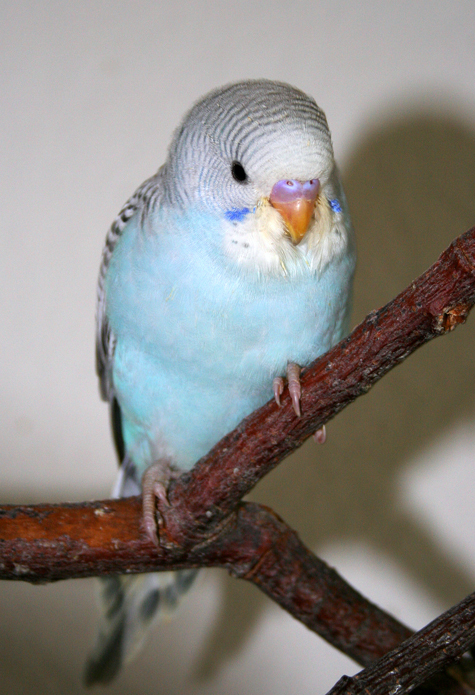 MOM is “Marley”, a yellowface violet-blue combination pied (recessive / clearflight / dominant) spangle American parakeet. 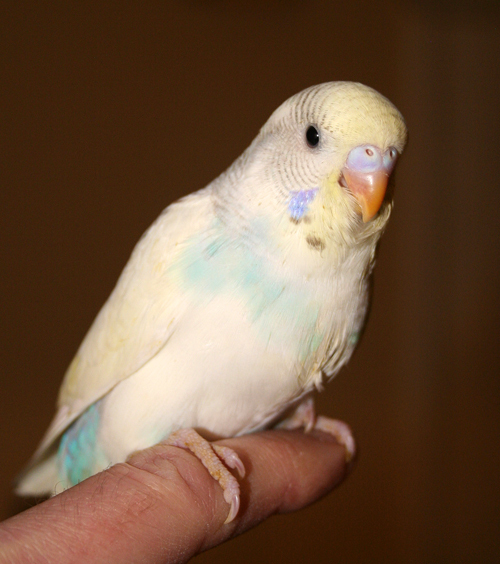 Throws dark-eyed clear when paired with recessive pied. DOB ~2009. Notes: I expect surprises because of Marley’s genetic combination. 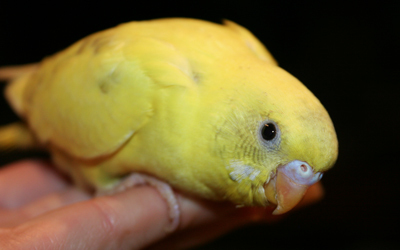 If we get some mutations I am striving for in my breeding program, I will keep several chicks. 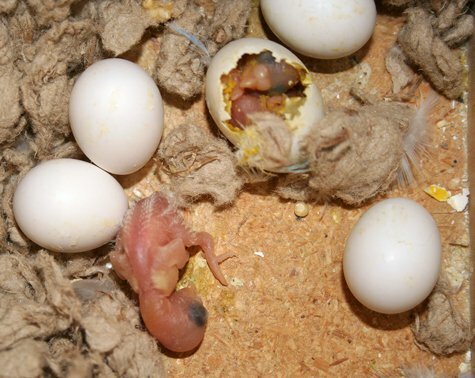 Outcome: 8 eggs; 7 fertile; 5 chicks (1 fertile egg had damage to shell; last chick died @ 1 day). First egg laid 9/29/11; last egg on 10/14/11. First chick hatched 10/19/11; last hatched 10/28/11. 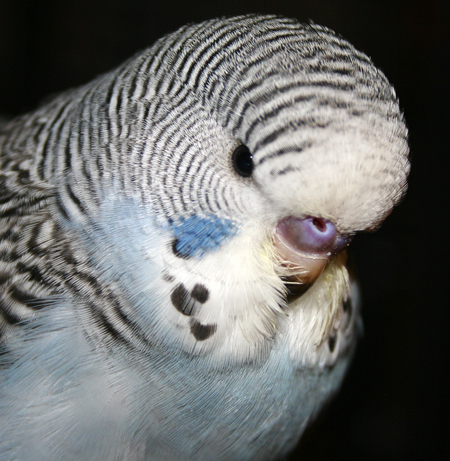 “Erie”: Normal gray English budgie. DOB 2010 by Kim in SLC, UT. 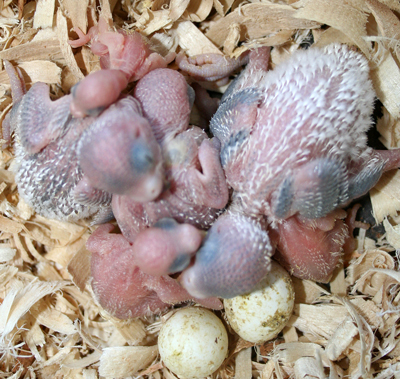 Outcome: 8 eggs; 8 fertile; 6 chicks (1 fertile egg had shell damage, last chick died @ 1 day). First egg laid 10/2/11; last egg on 10/17/11. First chick hatched 10/24; last hatched 11/1. Note: I will keep at least 2 spangles (esp. violet). RESERVED for Karen B. “Alex Karev”: #74. Gender: M. Color: blue/violet?. Mutations: spangle. Split: opaline, possibly greywing. DOB 10/26. Handfed. $85 if blue, $90 if violet. RESERVED for Jen. “George O’Malley”: #75. Gender: M. Color: blue/violet?. Mutations: spangle. Split: opaline, possibly greywing. DOB 10/28. Handfed. $85 if blue, $90 if violet. RESERVED for Jen. “Mark Sloan”: #76. Gender: M. Color: blue/violet?. Mutations: spangle. Split: opaline, possibly greywing. DOB 10/30. Handfed. $85 if blue, $90 if violet. Love looking at your babies! What beauties. Mongo, Em, Brow, Bandit, Blue Belle, and Shrek are all doing great. We are enjoying them so much and they have adjusted just fine. 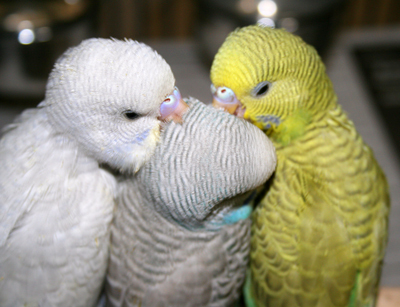 You do such a great job with these feathery sweet hearts….thankyou Jen! Your new “parents” are going to have a lot of fun! Thank you, Karen! How did you know that I was thinking of you all today? Seriously! Did a little birdie tell you? We love the baby photos. Soo cute! We would love to get Miranda Bailey (#77) and Alex Karev (#74), if possible. @Boardmans: Be mindful of the note: “I will keep at least 1 spangle (esp. violet)” that is posted for that clutch. There are 4 spangles (3 boys and 1 girl) so we’ll see soon when they’ve all feathered out. It shouldn’t be a problem for you to have one of the males, but at this point the female is looking to be a violet. If so, what is your 2nd choice to replace Miranda? If we can’t get Miranda, which we understand, Marina is our second choice. Thanks again for letting us have 2 of your sweet babies! To be sure, could we see a current picture of her and any other blue females. Thanks for your trouble! Hi Jen, just read your comment to me. Sorry it took so long to get back to this page. How funny! Maybe it was Belle :=) She is getting braver. 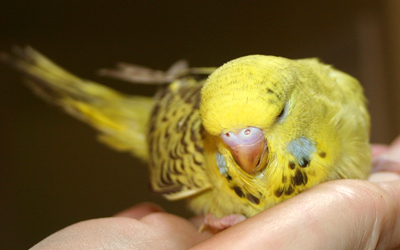 She climbed my arm one night when I was feeding her millet and on the same night we kissed through the cage. Shrek is such a happy boy. He makes everyone happy. Our flock improved, personality wise, when he joined it. I’m loving your new clutch. What beauties. Enjoy your holidays.